Just over the mountain range from Dakin Farm, the Mad River rushes forth from the eastern slope of the green mountains past the legendary Vermont ski areas of Mad River Glenn ("Ski It If You Can" is their slogan) and Sugarbush. It continues on past rugged mountain groves filled with hard rock sugar maple trees, where maple syrup is made, and through a lush green valley where dairy cows graze. The milk from these cows is made into Cabot Creamery's most coveted cheddar, Private Stock. The Mad River Wake Up combines Vermont's two marque agricultural products, Cheese and Maple Syrup, in their finest form! 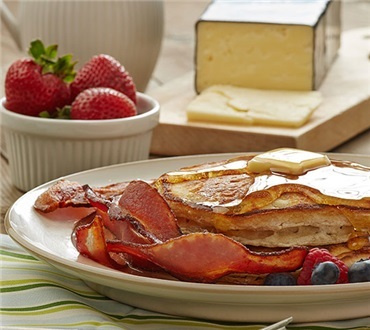 Who do you know that would love to wake up to a mouth-watering, Vermont breakfast inspired by the beautiful Mad River of Vermont? Sent this to my niece and her granddaughters. They loved it! Said that the box was packed well, package as described and are looking forward to Sunday morning breakfast!! Wish I had thought to order some maple candies to go with it. Oh, well.... Will do that with the next box! As usual, wonderful experience!! Thanks!